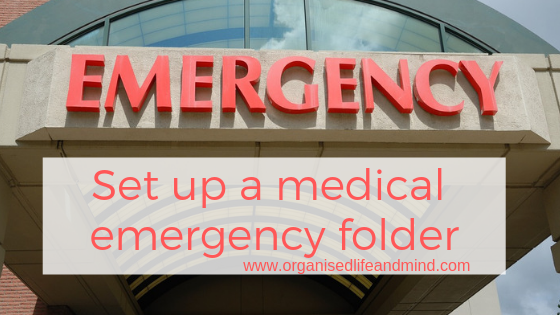 A medical emergency can hit you quicker than you’d ever expect. We learnt this late last year. “You need to sit down. Mom had to be hospitalised and will need an emergency surgery.” It’s the call I never want to have again! While the events of that day could have spiralled downwards, they luckily didn’t. And I’m very grateful for it! “When it rains, it pours.” Have you heard this saying? It’s referring how when something bad (or good) happens, it generally happens a couple of times. And guess what! It happened to us recently. A medical bill, a new laptop and a dead car this week. Thank goodness we had an emergency fund! Otherwise these unplanned expenses would have left us with a major bump. 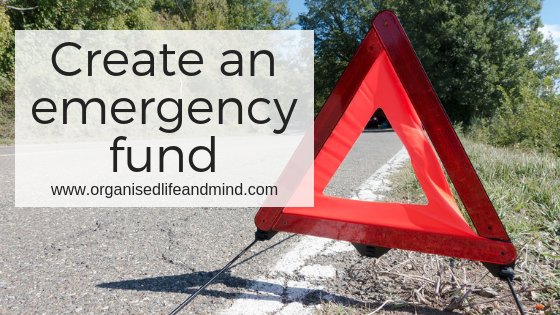 We want you to feel financially more secure for this unknowns and here are our tips for you to create an emergency fund. 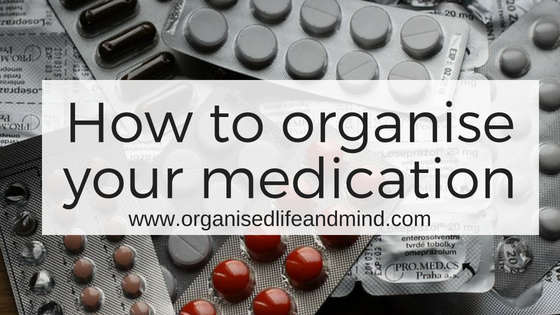 Going through your over-the-counter or prescription drugs can be a slow and successful start to your organising journey. It’s something you can do at your own time. So this week, put your favourite music on and keep you and your family safe. Review the medication you keep in your home. 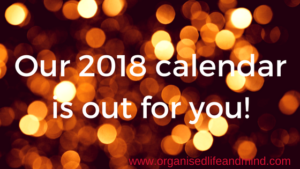 Our 2018 calendar is out! As we’re preparing for the New Year, we’re excited to present our free 2018 calendar to you! This year is almost over and many of my clients and friends are looking forward to 2018. Some are taking a few days off, spending time with the family and relaxing after a few busy weeks at work. Isn’t it amazing how we can be so focused and productive just to meet the weekly, monthly or even annual targets? Wouldn’t it be great to always be that driven? What will you let go this week? What are your plans for this week? A big presentation, a dinner with friends and some celebrations maybe? 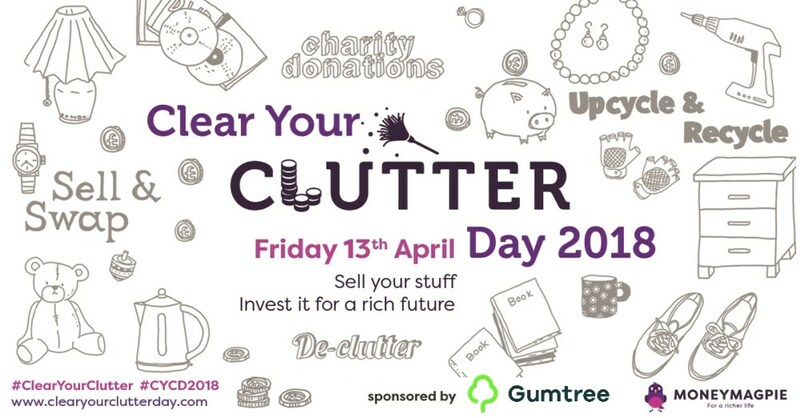 Take each day of this week to free yourself up from clutter in your home. It’s a simple as 1-2-3! Are you ready for your hospital stay? Being hospitalised can be daunting and scary for many. I remember my surgery in 2012 and while it was the best thing for me, my family was worried. There’s the risk any surgery brings along. You never know the outcome and having a doctor who’s well trained and experienced in the field can make a difference. Equally important is a doctor you can talk to, who answers your questions and listens to your concerns is vital. With so much on your mind, packing is probably at the bottom of your thoughts. That’s why we prepared this checklist for you! You need to have surgery? So, your doctor told you that you’ll need to have surgery. There are probably a thousand questions running through your mind. 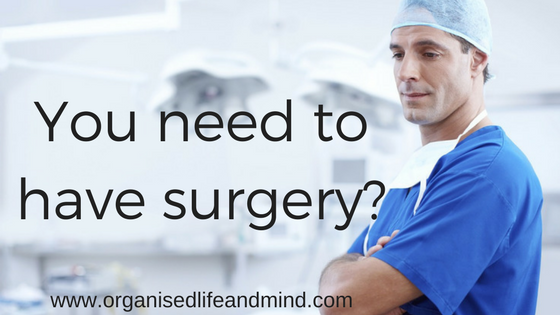 Will the surgery have the desired outcome and relief? What are some of the risks involved? And who will look after my family and home? While initially you may be surprised or even shocked, the better prepared you’ll enter that hospital, the smoother your recovery can be. Are you prepared for the unprepared? Earlier this week, I got an unusual request from a previous client. They had major water damages in their home and, due to work requirements, were unable to wait for the plumber. “We’ll be there between 9 am and 5 pm. Yes, we understand this is an emergency.” If you’ve ever been in this situation, you can understand my client’s predicament. Luckily, my schedule allowed me to stay at their villa and wait for the plumber. Are you prepared for the unprepared?